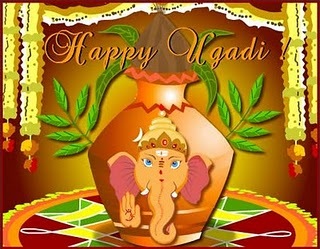 'Ugadi stands for Yuga (Age) +Aadi (Begining) = Yugadi marks the beginning of a new Hindu lunar calendar. It is said that Lord Brahma started the creation on this day. Ugadi falls on the "Chaitra Shuddha Padyami" of every year. In maharastra it is knows as "Gudi Padwa". Sindhis call it "Cheti Chaand". Hindu Vasantha Navaratri also starts from this day. It is vrey auspicious day knows as a part of sade tin muhurtha. It is celebrated with a lot of pomp, especially in South Indian states. "Ugadi pacchadi" ( ugadi chutney ) is a noteworthy item during this festival. It is made of tamarind, raw mangoes, jaggery and neem flowers. The meaning of this is that all joys and sorrows have to be treated alike throughout the year. This auspicious day is also known for 'Panchanga Sravanam' which is chanted mainly by the purohits and the scholars. Panchangam is the Hindu almanac(calendar). It contains enormous mathematical work on the movement of celestial bodies. The ancient vedic sages and scholars have explained the astronomical phenomena and have formulated many principles. The literal meaning of panchangam stands for the five limbs(Pancha angas). They are: Tithi, Vaara, Nakshatra, Yoga and Karana. The panchangam is an integral part of the Indian astrology and is referred to by the astrologers and the common people. Traditionally, on the day of ugadi, people used to visit the temple and listen to the panchangam which is chanted by a Siddhanthi(scholar). It was a social function where the scholar used to make general predictions to the gathering regarding the future aspects. It is said that panchanga sravanam does good to the people. The forecast for the happenings in the country, different places and in the lives of people based on their raasis would be predicted. It would be an yearly forecast(usually from April to March). Panchangam is deeply connected to astrology(Jyotisha) and the sravanam is heard by many during ugadi. Every year has a name associated with it. The predictions are done for the whole year. Politicians, businessmen pay a lot of interest in the panchanga sravanam so as to know their future in their particular field. Meaning: "Panchangam contains all the auspicious things. It is a weapon that destroys the evil, dispels the bad dreams and qualities in a person and gives the purity of bathing in the Ganges. A person gets the punya of donating a cow, the quality of life increases , attains good nature, good off-springs are born by following it. The panchangam indicates the good qualities and hence everyone must hear it." Thus, listening to the Panchangam and following it cultivates good habits in the people. The commoners must use this vedic science to improve their living standards. Additional information can be found here.